This classic archaeology-adventure tale about Central America is back in print! In 1937, Dana and Ginger Lamb set out from Tucson, Arizona with $10.16 in their pockets and ended up in the unexplored jungles of Chiapas, Mexico, and Guatemala. Traveling by foot, horseback and burro-powered Model-T Ford, the Lambs trekked into a lost world of bandits, hermits, and an ancient civilization. 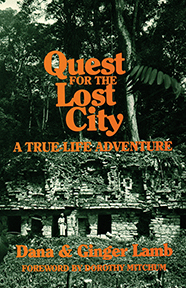 They discover a lost tribe of Mayans and ultimately a lost city in the jungle. Later they met with President Franklin D. Roosevelt and were a media sensation. Exciting and true! Last few copies from a box of new books found in the warehouse!